Initially, we wanted to take trains as much as possible in SE Asia. Although, as trains are either non-existent, take much longer, and are more expensive than buses, decided to indulge a little this time. 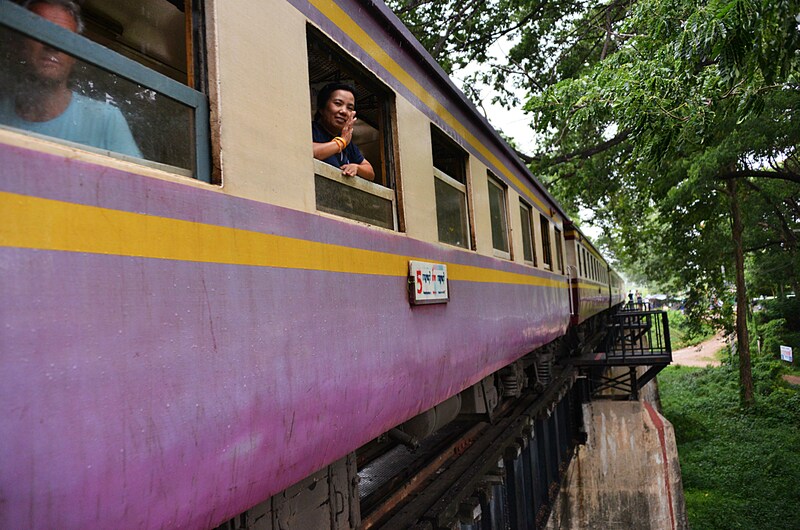 The train from Thon Buri station in Bangkok to Kanchanaburi leaves at 13:55hrs, takes about 2.5 hours, and is an easy pleasant trip. 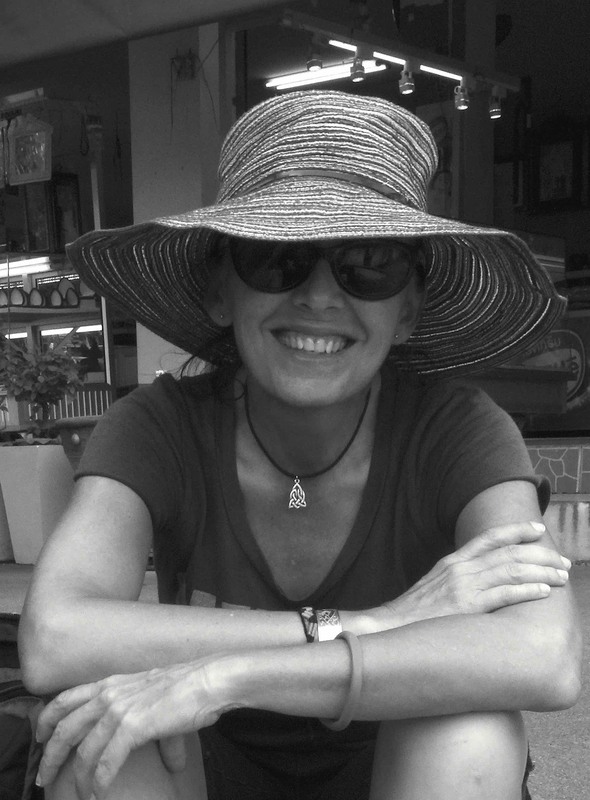 I’m not keen on the driving in Thailand as it can be quite dangerous – but nothing like in Vietnam. Escaping the hoards at the bridge! Beautiful River Kwai Valleys dominate Kanchanaburi’s north-west area and with great natural beauty, numerous waterfalls, lakes, caves, and mountainous scenery, it’s a not-to-be-missed destination. You can visit many attractions from Kanchanaburi as a day-trip. The best way to visit the sights is by hiring a scooter as typically, local trains and buses are slow and infrequent. Because of this town’s proximity to Bangkok, it’s easy for many locals and foreign tourists to use Kanchanaburi as a chill-out spot getaway. And so, the town is also experiencing an ever-increasing and thriving backpacker scene. 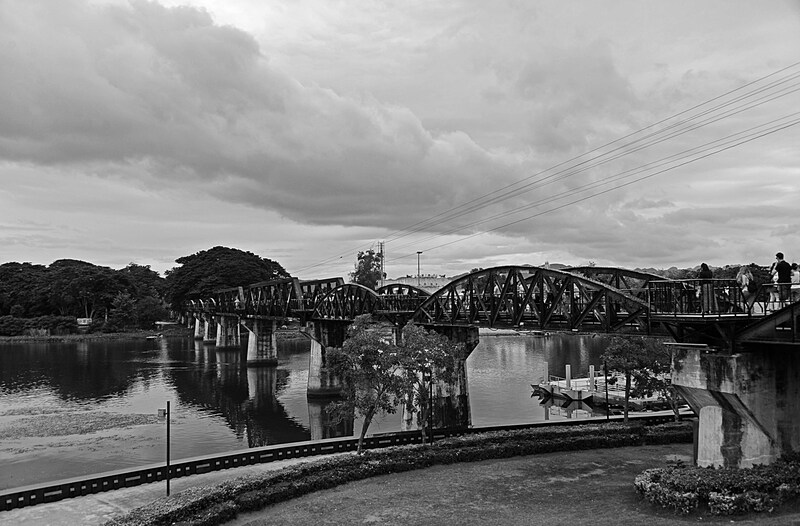 Most travellers visit Kanchanaburi to see the Bridge over River Kwai or the Death Railway. 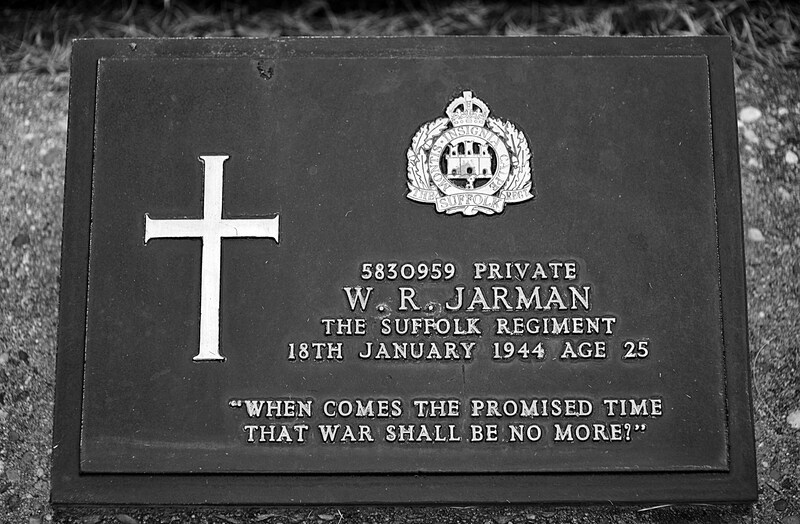 Not only is Kanchanaburi a striking city set where the Kwai Noi and the Kwai Yaiet rivers converge, everyone should visit the Kanchanaburi War and the Chungkai Cemeteries so that this abhorrent chapter in history is never forgotten. 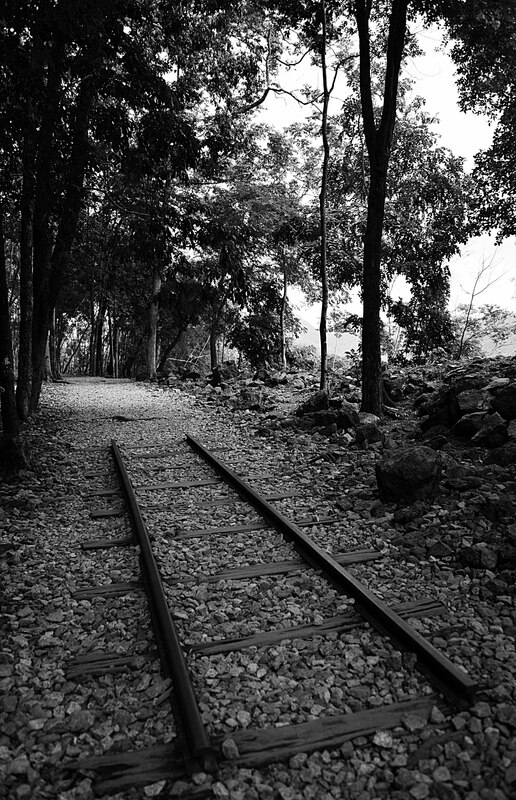 During WWII, the Japanese army force-built the infamous Thailand–Burma Railway, at the sacrifice of thousands of POW lives. 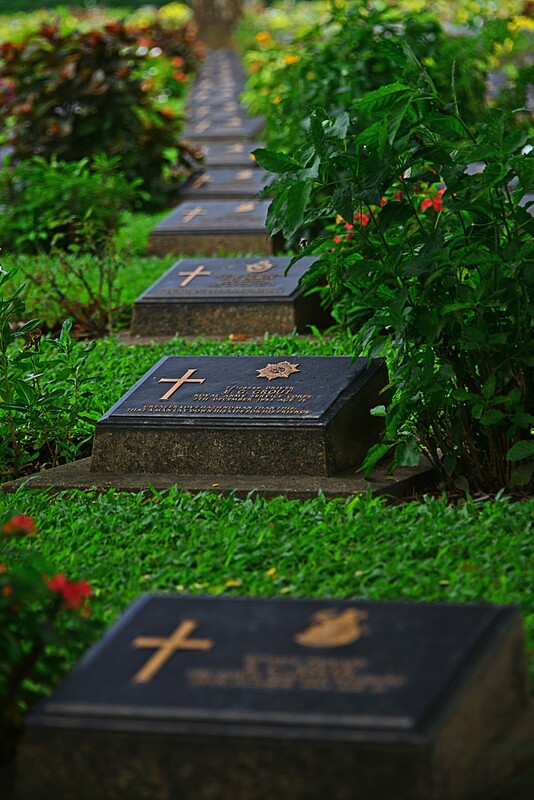 Try to visit the Kanchanaburi War cemetery in-between the numerous arriving tour groups and buses for a more private experience, or wait until they leave. Actually take time to read some of the Epitaphs from remaining family members – sure to bring a tear to the eye. On my visit, a photo shoot was taking place with the model wearing outlandish vibrant pyjamas. Not only is this bad taste considering the location, but also tacky. The four people showed no respect for this cemetery, laughing loudly and carrying on as if in a pub, not in such a sombre place. I felt like saying something but I didn’t. 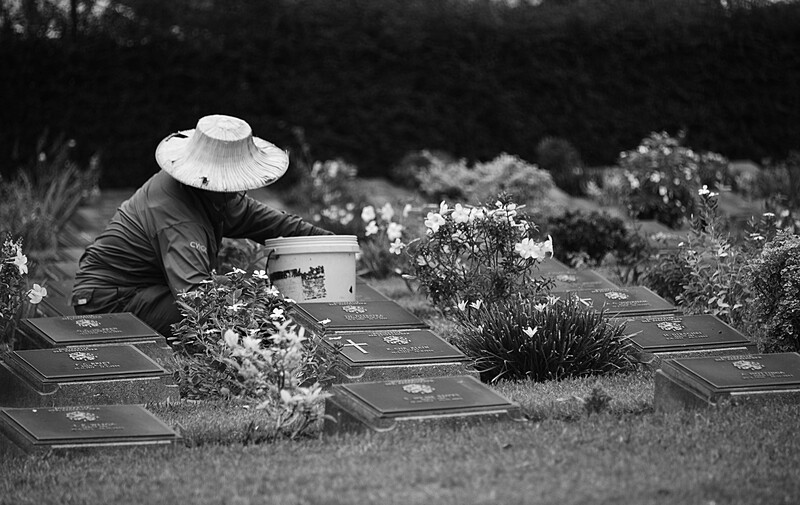 I’m not sure that locals would appreciate foreigners behaving the same in a Thai cemetery. Nothing has changed in 70 years! I must say that I am both disappointed and amazed to finally see this bridge. The bridge’s history is so memorable that Hollywood also made it even more famous and everlasting. Many cheap stalls grace the surrounding area. You can also indulge in a child-like train ride over the bridge and back (at a cost of course). Be prepared for thousands of local and foreign tourists. It’s very hard to even contemplate a photo of the bridge without a sea of heads and hats in your shot – like a swarm of bees. And of course, people don’t respect that you’re taking a photo…why should they as they’re taking their own. Floating restaurants and accommodation abound the riverfront. The ambiance is not what I expected but still had to visit, just to see this infamous structure. It’s incredible to think that this 415 kilometre railway over inhospitable territory was mostly built by POW slaves (Australian, British, Dutch, and Americans). About 60,000 allied POWs and later joined by about 200,000 conscripted Asian labourers worked on the link, which began in June 1942 and completed 15 months later. By the time the line was completed, an estimated 16,000 POWs and 100,000 Asian labourers died while working on the railway. 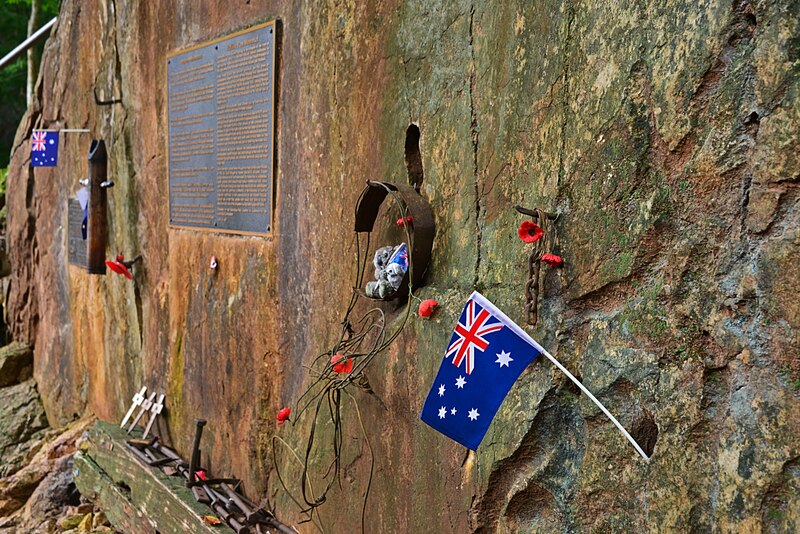 The museum at Hellfire Pass was started by an Australian-Thai group of volunteers and former POWs. It is free to enter, but a donation is appreciated. It’s excellent, tastefully delivered, and a preamble to what lay’s ahead. Actually, you can say the same for the whole of this site – it’s excellent and memorable. Walk along this incredibly moving noiseless path whilst listening to real-life stories recounted by surviving POWs. Hearing these emotional voices, you can’t help but be thrown back in time and forced to imagine what it would have been like in this hostile environment. Working for 18+ hours a day under abhorrent conditions, negligible food, and sadistic treatment by Japanese and Koreans guards. Without a doubt, this experience is both heart-wrenching and eerie. 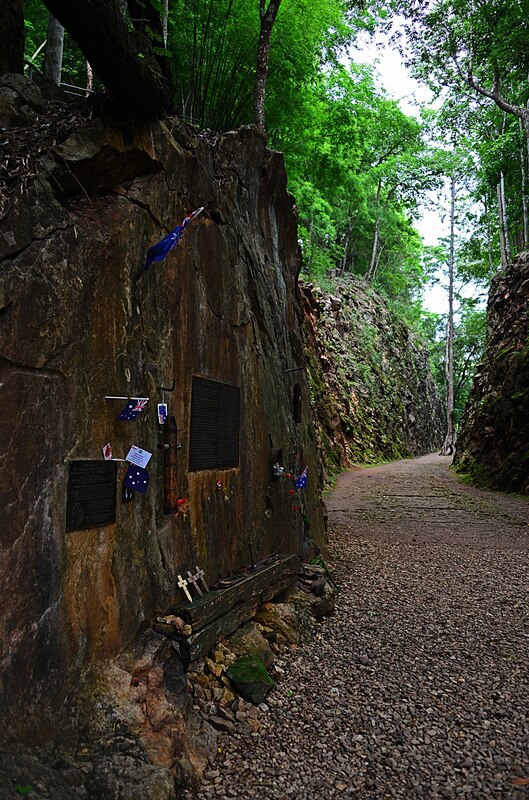 Especially, the memorial walk along the stretch of line known as Hellfire Pass. The infamous passage makes you appreciate how high, deep, and impenetrable the rock-face is but mostly how gruelling the task for the POWs must have been with only dynamite and basic tools such as pick hammers. This is a special part of Thailand I will never forget and believe that everyone should visit, to learn more of and understand what occurred. Try and do the longer walk of about a 6km (round trip) along the remains of the Death Railway and make sure you take the free headphones provided by staff. This walk takes you up to the fence where you cannot cross further as it’s a military zone. The entry fee has gone up (B120) from what the guide-book advertised. I no longer believe any prices in the outdated guide books, regardless of its published date. I’m not so sure you can really “enjoy” a site as this. Although, the history represented about the actual construction of the railway is objective and very informative. In comparison, the Hellfire Pass Museum is a very emotionally different experience as this is more about the human suffering endured. Save yourself 10B (increased to 20B in 2015) and don’t bother with this cave as it’s nothing special; a cave with Buddha images. You have to get there by bike or other transport (if available) as it’s 5 kms out of town (past Chongkai War Cemetery) and too far to walk from Kanchanaburi. Walking around in the cave only takes 10 minutes and doesn’t offer anything really. I hear there are more impressive caves in this region than this one. 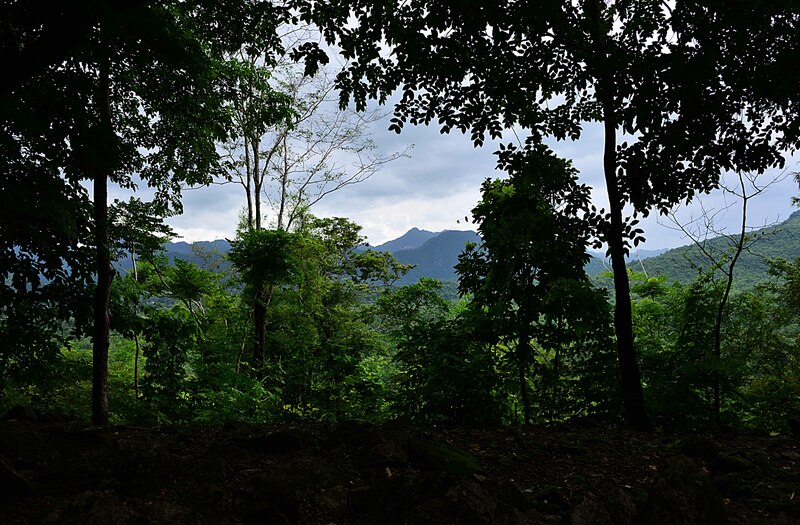 After the walks and sights above, and if you’re still feeling energetic, Kanchanaburi is surrounded by easily accessible waterfalls, national parks, and as always, a plethora of temples. The small but comfortable double room with private bathroom in the Baan Ma Feung Guest House ( 257/1 Baannue, Sangchuto Road), did not include breakfast. Although, the small restaurant on the premise offers the best coffee in Kanchanaburi and a good breakfast, at reasonable prices. The service is great and you won’t be disappointed. The location is about a 20-minute walk to the museums but only a 10-minute walk, before you hit roadside food stalls and restaurants. 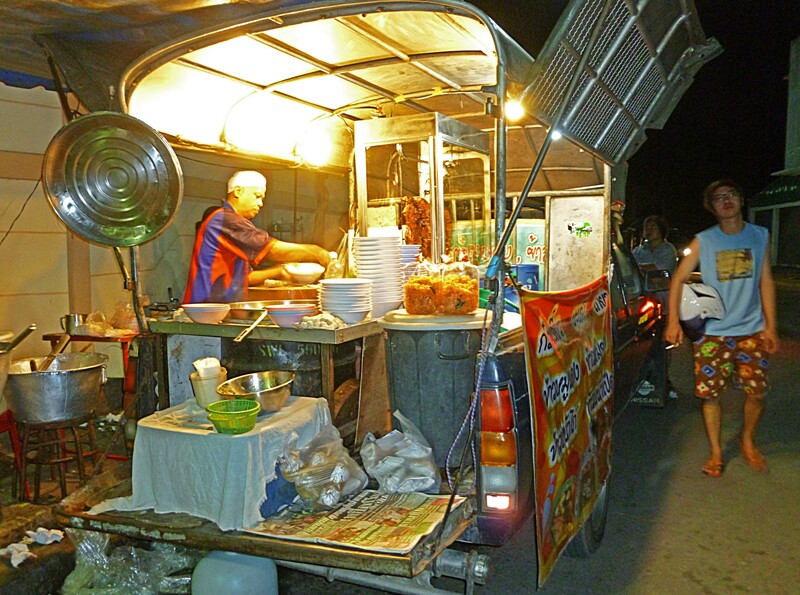 As with everywhere in Thailand or SE Asia for that matter, the street food surrounds you and you don’t need to walk far before running into a food hawker, typically, on the next block! This is where we ate each night as it’s cheap, fresh, and no frills but definitely hits the spot. There’s a guy that cooks delicious soup dishes out of the back of his utility truck and is busy with locals every night; ate here a couple of nights as the food is good, fast service, and very cheap (30-40B chicken soup bowl). From the back of a roadside soup truck, delicious food is created! If you feel like splashing out on an expensive meal, then Kanchanaburi offers many pricey restaurants and with western food as the city is a major tourist destination. Wanted to do a short stint volunteering for the same organisation again as in Khao Lak, so ventured by bus to the next destination…Mae Sot, Western Thailand and along the Burma-Thailand border. Visit my Nilla’s Photography Thailand Gallery for more images. More posts on Thailand. Fantastic photos and info Nilla! Hi, thank you and I appreciate your feedback.